Who’s looking for cute Valentine’s Day Treats for Kids?! These Conversation Heart Rice Krispie Treats are easy to make with only 5 ingredients and the end result are adorable “chocolate” covered Valentine rice krispie treats everyone will love! Sweet and Chatty Valentine Rice Krispie Treats! I was never one for traditional Valentine’s Day treats. A box of chocolates with unmarked fillings makes me nervous and conversation heart candies are a bit chalky in my opinion. But the latter are fun, which is why I decided to make Conversation Heart Rice Krispie Treats instead! 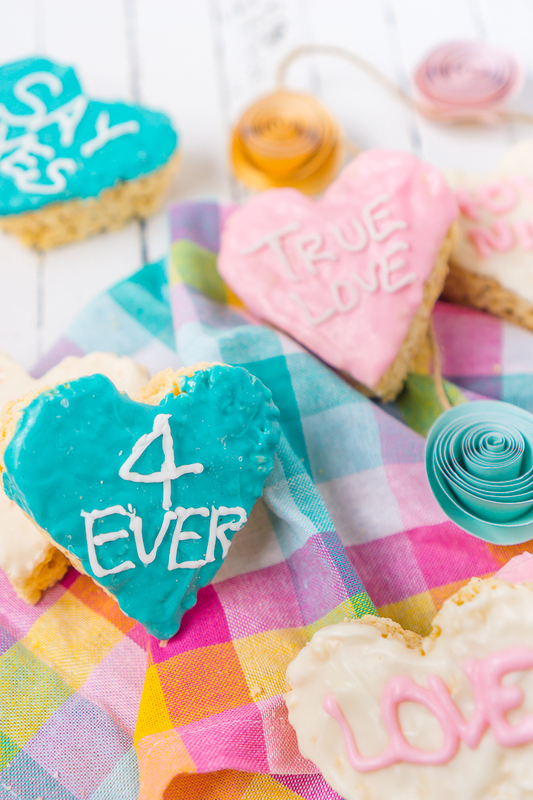 You have the classic rice krispie treat recipe that everyone loves coated in a layer of candy melts and decorated with adorable Valentine’s Day sayings like Hug Me, I Love You, and True Love! These are perfect Valentine’s Day Treats for kids! The recipe is very kid friendly, with microwave instructions for the rice krispie treats as well as stovetop directions. After making them and cutting them out into hearts comes the really fun part – decorating them! Kids will love getting to choose the colors for the hearts as well as the sayings! Wilton Icing Pouches with tips make decorating a breeze and make this a very easy Valentine’s Day party activity. 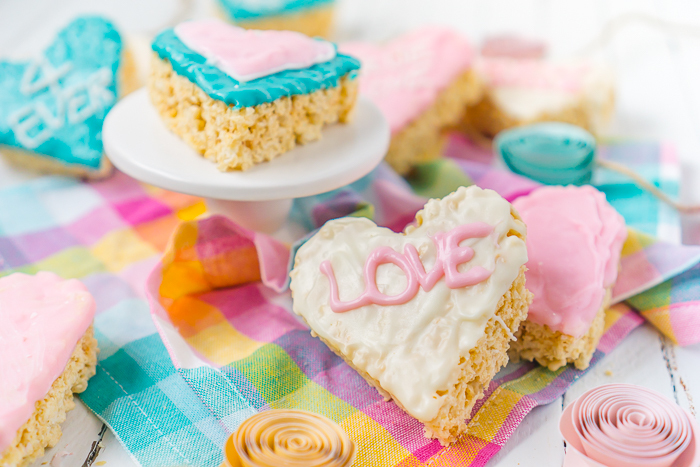 You could prep the heart shaped rice krispie treats as far as you could like (coated or not) and then buy icing pouches in a wide range of colors and let the kids have fun! They can take home their creations to their parents or devour them before the party is even over. I decided to use candy melts for this particular rice krispie treats recipe because I don’t mind the sweetness they bring to the treat since they aren’t overly sweet in my mind to start. I also love keeping things simple and buying the candy melts meant that I didn’t need to get out my Wilton Color Right System (which I love so much more than the old gels by the way!). However, you definitely melt white chocolate chips instead if you would like and color as you wish! Making rice krispie treats is one of the simplest dessert recipes you can make, which is why it’s been a family favorite recipe for so long. First, you melt your butter and marshmallows. If you are cooking on the stove, you will heat the butter and then add the marshmallows, stirring until smooth. If you are cooking on the microwave, you will heat both together for two minutes and then in one minute increments after that until they are smooth when stirred. You will then add the rice krispie treats after removing from any heat source and stir until well coated! Pat them down into a 9×13 baking dish coated with cooking spray and let cool. Done! They are definitely best the first day, so I suggest making the day you want to enjoy them. Now Let’s Make Some Cute Heart Shaped Rice Krispie Treats! 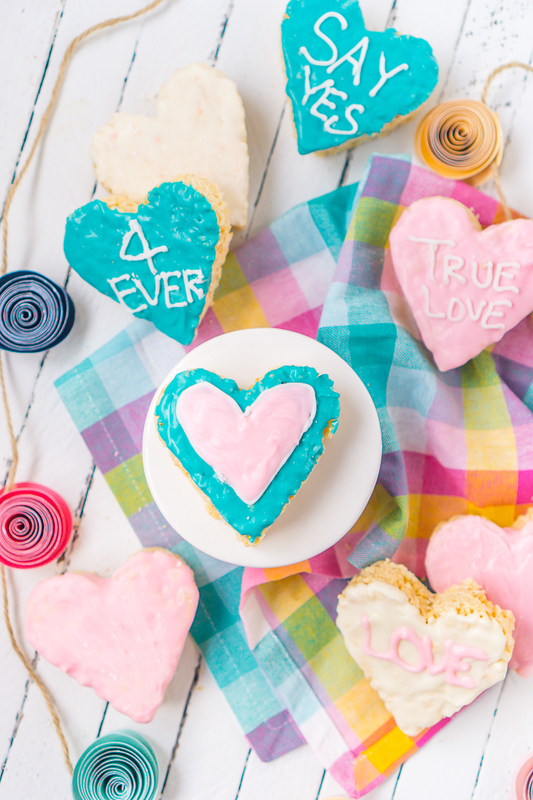 Heart Shaped Rice Krispie Treats coated in candy melts and decorated with Valentine’s Day sayings like Pick Me, True Love, and Kiss! A fun Valentine’s Day Treat the kids will love decorating! 1 cup Candy Melts in your desired colors. If doing 3 colors, do around 1/3 cup for each color. Melt the butter over low heat in a large stock pot. Add the rice krispie cereal and stir until well coated. Prep a 9x13 pan with cooking spray. Then, using wax paper, evenly press mixture into the even layer in the pan. Let cool. If you want rice krispie treats to be thinner, spread out between two pans. You might need to do one 9x13 and one 8x8. In microwave-safe bowl, heat the butter and marshmallows on high for 2 minutes. Stir and then heat for another minutes. Stir again until smooth and evenly combined. Cooking time may vary depending on microwave so add more time in 30-60 second intervals if mixture is not smooth after stirring. Follow steps 3 and 4 above. Lay out a sheet of parchment paper and flip over your 9x13 pan so the rice krispie treats come out onto parchment paper. Using a heart shaped cookie cutter, cut out your heart shaped rice krispie treats. In a small microwave safe bowl, heat candy melts in the microwave at 30 second intervals stirring each time until completely melted. Dip rice krispie treats in the candy melts, shaking off excess chocolate. After slightly cooled, dip again for thicker coverage. Let cool. Using a piping bag with icing (I buy the prepackaged Wilton icing bags for projects like this), write your desired phrases on your conversation heart rice krispie treats.